Can you see the change of gauge? I went from a size 2 (2.75 mm) to a size 1 (2.25mm) –i do have 1 set of 1.5(2.5mm)needles –but I don't like them much) and besides—the fabric of the sock was too soft and drapy—I really felt I needed to go smaller—and went not 1 silly millimeter, but just a half—and up close and personal, I can see the change. I know I will feel the change too, with sturdy sock (foot) giving way to soft drapy fabric on the leg. 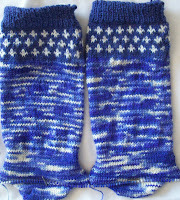 There is a bit of pooling of the color way too—but I think that is mostly from the gusset--(and change of stitch count per round—the pooling seems to be less evident every round and I suspect most of the foot won't have any pooling to speak of. 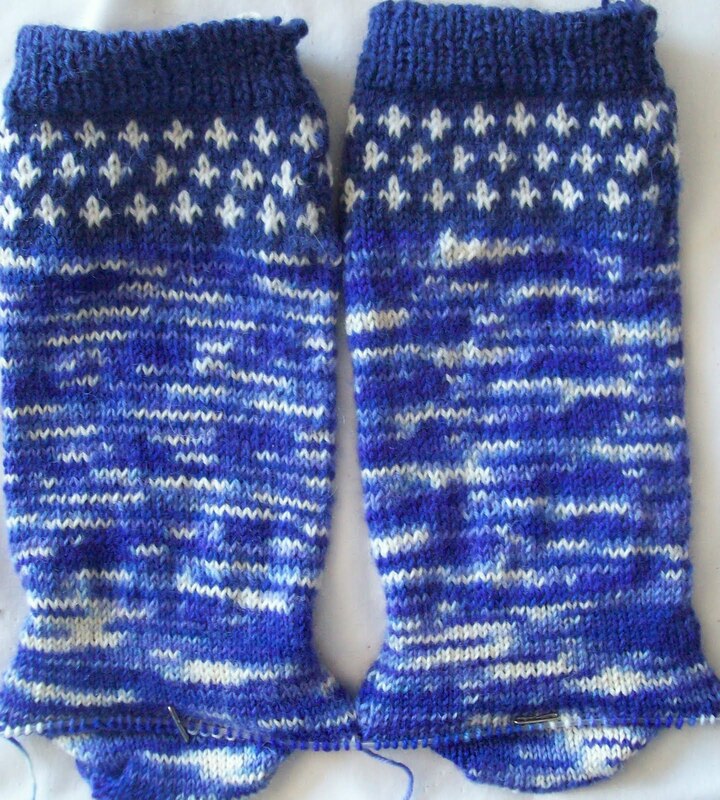 I still have a few more rounds before the gusset is finished--and there is less pooling of color. Hurricane Earl passed by—but 200 miles out to sea (from NYC) and we had nothing but a steady breeze (High presure systems have had stronger winds!) and a drop (¼ th inch!) of rain. But it ended the last heat wave –today the sky is bright blue with a few high puffy white clouds—and lovely 80° temps. Its is a bit cool and breezy for a pool day--but the pool closes for the season on Monday--and now, every day is a must! The weather is gorgeous here today. I don't know if we got any rain at all in the Bronx. We are experiencing some high winds today. I really love those socks. I do hope that you don't get pooling, though. I really want the color to blend.